Ngee Ann Development Pte Ltd (NAD) is a subsidiary of The Ngee Ann Kongsi that manages the leasing of office and retail spaces in Ngee Ann City. Ngee Ann City is a commercial and civic project conceptualized by The Ngee Ann Kongsi, through Ngee Ann Development Pte Ltd (NAD), with Orchard Square Development Corporation (OSDC) in 1988. This massive shopping and office complex lies in the heart of Orchard Road. In 1989, Ngee Ann Development and Takashimaya Co. Ltd signed the joint venture agreement where Takashimaya entered a 20-years lease for the NAD portion of the shopping centre with the rights to name it Takashimaya Shopping Centre. Ngee Ann City sits on land that belongs to The Ngee Ann Kongsi. In the 19th century, The Ngee Ann Kongsi bought a 29-hectare tract of land from the East India Company. The parcel was known as Tai Shan Ting, one of several burial grounds owned and managed by The Ngee Ann Kongsi. The cemetery was cleared in 1957 to make way for commercial and luxury residential developments. Some of the land was leased out to Mandarin Hotel, Orchard Theatre and Wisma Indonesia. A 10-storey Ngee Ann Building was also erected. For a long while, large tract of the land remained undeveloped. Since early 1970s, Ngee Ann Kongsi and OSDC had been working on developing a modern shopping, residential and office complex. Meanwhile, in 1979, the government acquired a large portion of the land for general development, including the building of an MRT station and road widening projects. After years of intense planning, the building of Ngee Ann City eventually took off in 1988. The complex was officially opened in 1993. In retrospect, the complex is a means for The Ngee Ann Kongsi to build and expand on what the forefathers had achieved. In addition to the commercial purpose of the complex, in order to bring forth the community spirit of Ngee Ann Kongsi, the semi-circular Civic Plaza was constructed. It is often used as a venue for many community events such as the Christmas Light Up, the Lunar New Year Chingay Procession, Annual National Lion Dance Championship, Singapore Food Festival, and recently, the Home Team Fair. Above all, the revenue from Ngee Ann City enables The Ngee Ann Kongsi to contribute and fund more educational and other charitable projects. Hence, Ngee Ann Development plays an important role in The Ngee Ann Kongsi’s contribution to Singapore. 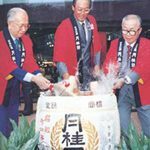 Celebrating the official opening of Ngee Ann City with the traditional breaking of a sake barrel.